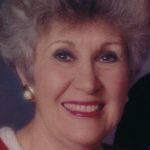 Sara Gray Baker, of Granbury, Texas, passed away peacefully and enveloped in God’s love on Tuesday, January 29, 2019. She was 89 years old. She is survived by her daughters: Alicia Gerber of Addison, Texas and Allison Gray and husband Scott Beyer of New Canaan, Connecticut; her much loved grandchildren: Austin Gerber, Reese Gerber, Gray Beyer and Rachel Beyer; her sister, Martha Gray Snider; her sister-in-law, Marylene Gray; and her nieces, nephews, grand-nieces and grand-nephews. She is preceded in death by her parents, her brother, Kenneth Gray, and her husband of nearly 57 years, Dr. George A. Baker. A celebration of her life will be held at Grace Chapel on the campus of Howard Payne University, Brownwood, Texas on Saturday, April 27th at 1:00pm with a reception immediately following. All are welcome. In lieu of flowers, the family requests donations to The George and Sara Baker Endowed Scholarship Fund, Howard Payne, University, P.O. Box 2369, Brownwood, TX 76804. Be the first to share a memory of Sara.